Natural fabrics such as cotton linen and rayon are becoming increasingly more important to our customers. Every season Esteems Boutique are receiving more and more requests for natural womens clothing items. Our ranges are evolving to meet this demand and we are proud of the fact that our 2019 Summer and Winter ranges are predominantly made from natural fabrics. DWIJ is the latest new fashion label we have fallen in love with and Esteems Boutique are proud to now be a stockist of this exciting label. DWIJ is the sister label of Orientique; one of our all time best selling labels. 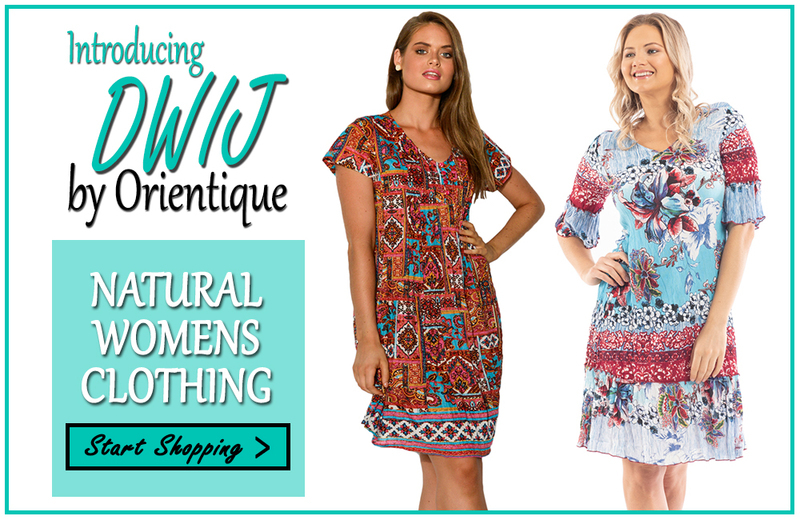 Designed and manufactured by the same team, both the DWIJ and Orientique labels are at the forefront of Australian natural womens clothing. With a focus on natural fabrics, beautiful prints, great shapes and a size range from 10 – 20, DWIJ garments are made with the Australian woman in mind. This year the Australian Summer has and will continue to be long and hot. It is predicted that the heat will continue well into the Autumn season. With this in mind, it is time to start thinking about the new Autumn season and how we are going to dress for the transeasonal weather. Choosing natural fabrics for your wardrobe is a great place to start when thinking about the longevity of your wardrobe items. Natural womens clothing isn’t just perfect for keeping you cool during the hot Australian Summers but it is also ideal as a base for your Autumn/Winter looks. Having natural fibres close to your skin when creating layered styles is ideal to stop you from sweating as the temperature changes throughout the day. Look through your wardrobe and see if you can use some of your favourite Summer pieces as a base for layered looks throughout Autumn. Consider re-styling your Summer dress with leggings, boots, cardi and a scarf or styling your basic Summer tee’s with jeans, joggers and a jacket. Looking for natural womens clothing online at Esteems Boutique is easy. Every item made from a natural fabric features a badge to highlight its fabric content so you can see at a glance what it is made from.